It isn't perfect, but Motorola's latest flagship has a lot of compelling qualities -- and considerable bang for the buck. How do you take one of Android's best phones and make it even more enticing? That's the challenge Motorola faced this year as it sought to move its widely acclaimed Moto X forward to a third generation. The company's answer is the new Moto X Pure Edition -- a device that takes the same basic blueprint as its predecessor and supersizes it, both figuratively and literally. Perhaps the most noteworthy feature of the Moto X Pure Edition is its price: The phone is being sold unlocked for $400 -- a full $100 less than the starting price of last year's model and $300 to $400 less than most current flagships, which tend to retail for $700 to $800 off-contract. The Moto X will work on any U.S. carrier, so you can simply buy the device from Motorola, Amazon or Best Buy and pop in any SIM card. If you want to change to another carrier, all you have to do is get a new card and swap it in. Sounds pretty intriguing, right? It should -- but there are some caveats. After spending the past several days using the Moto X Pure Edition in the real world (and spending the past year using the previous-gen Moto X as my own personal phone), here's what I've discovered. At first glance, the Moto X Pure Edition looks more or less like a bigger version of last year's 2014 Moto X. The phone has the same gently curved back surrounded by the same aluminum frame. The front even has the same metallic grilles at its top and bottom. 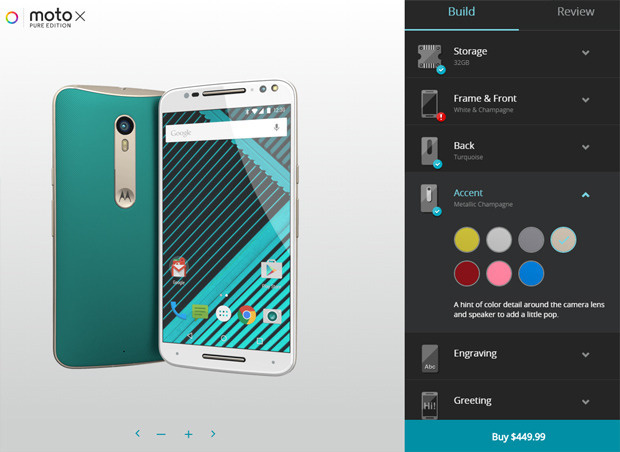 From there, the Moto X Pure Edition starts to set out in some new directions. First of all, the plastic backs on this year's phone represent a change from those used on past Moto X models: While past devices offered a smooth-feeling "soft touch" finish, the new phone has a "soft grip" texture with a diagonal-line pattern and an almost rubber-like feel. It's easy enough to grasp, but I can't help but think it comes across as a bit less elegant than the "soft touch" style of yore. Personally, I'd lean more toward one of the leather or wood options to get a more premium and distinctive appearance. This year's leather features a new "Saffiano" finish, described by one leather-maker as being a highly durable and scratch-resistant material. The wood finishes, meanwhile, are mostly the same as last year's -- though a new dark "charcoal ash" option replaces the lighter "teak" style from 2014. All the models can be custom engraved at no extra cost, and all give you a choice of seven different accent colors that'll appear on a new metallic strip on the phone's back as well as on the metallic grilles on the front. Speaking of those grilles, they both hold functioning speakers this year -- a welcome change from last year's phone, where only one actually produced external sound. Music played from the device is noticeably louder and fuller sounding as a result. It's still a little light on bass and not quite at the level of quality you'd get from an audio-focused phone like the HTC One, but that outlier aside, it's easily one of the best speaker setups you'll find on a smartphone today. The big question surrounding the new Moto X is just how big the phone really is -- and whether its enlarged footprint makes it too difficult to use. It's something you'll definitely want to think about carefully, especially if you're coming from a previous Moto X device. There's no way around it: At 6.1 x 3 in., the Moto X Pure Edition is no small phone. For perspective, it's about the same size as Samsung's Galaxy Note 5 -- 0.03 in. taller and 0.004 in. wider, if you want to get down to decimals. That's quite a boost in size from the 5.5-x-2.9-in. frame on last year's Moto X, particularly when it comes to height. And if you remember, last year's phone was already a significant bump up in size from the previous year's model. 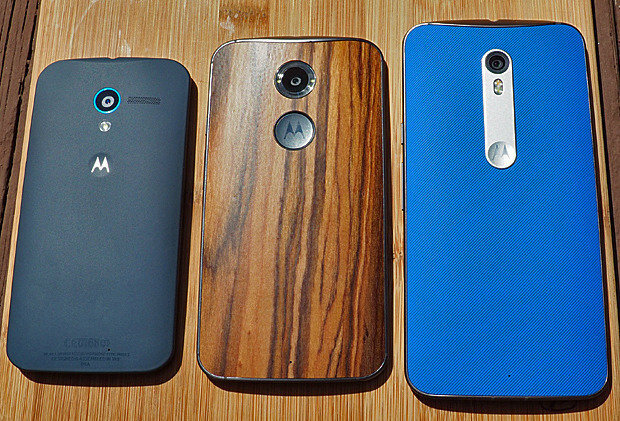 Side-by-side: The first-gen Moto X (left), the 2014 Moto X (in wood) and the Moto X Pure Edition. In other words, while the 2014 Moto X took Motorola's flagship from being compact to being at the upper limit of the standard-sized smartphone domain, this year's device goes boldly into the land of plus-sized ("please-don't-call-them-phablets") phones. Like Samsung did with the Note 5, though, Motorola has managed to slim down the bezels and keep the device's width in check -- which makes a world of difference for what the phone is like to hold. As I noted in my Note review, it's the width that typically makes plus-sized smartphones hard to wrap your hands around -- and both the latest Note and the new Moto X are only minimally wider than most current standard-sized alternatives. The Moto X's curvier, slightly thicker back and its warmer materials make it even more natural to palm than the Note, too; even with my relatively-small-for-a-man hands, I've had no problems hanging onto the device and feeling secure. That being said, I do find that the extra smidgen of width combined with the added height makes a phone of this size somewhat awkward to use single-handedly -- you just can't reach everything on the screen without fumbling around and doing a lot of shifting. The height also makes it a touch too large to carry comfortably; even in my decidedly untrendy loose-fitting pants and shorts, I'm always acutely aware of its presence. I often find myself having to move it around in my pocket to keep it from falling out in places like the car or the gym. As with any plus-sized phone, it's very much a tradeoff -- and whether that tradeoff makes sense for you is a question only you can answer. The main benefit you get from carrying a larger phone, of course, is enjoying a larger display. The Moto X packs a spacious 5.7-in. screen -- the same size as the Note 5's display -- and that gives you ample room for all of your browsing, reading and video watching. Aside from full-screen items like videos, on-screen elements aren't generally any larger than what you'd see on a standard-sized smartphone; instead, you end up seeing more content on the screen at a time -- more lines of text in an article or more emails in your inbox, for instance -- which can certainly be nice. I have to say, though, I'm not entirely thrilled with the display that Motorola put into this device. The screen uses LCD technology, which is a change from the AMOLED tech that's been present in past Moto X models (and is also used in Samsung's Galaxy devices). The Quad HD panel is crisp and clear, and its whites look better than those on last year's Moto X -- but the rest of its colors look less bold and even a little washed out compared to an AMOLED screen's richly saturated nature. To be fair, most people probably won't be bothered by this; it's the type of thing you notice only if you're looking at two phones side by side (or if you've spent a lot of time staring at smartphone screens in general). And yes, we're very much talking "first world problems" here. But for anyone who places a fair amount of value on display quality, the difference is difficult to unsee once you've tuned into it. The use of LCD is also perplexing in that it isn't particularly well-suited to one of Motorola's most distinguishing and helpful features: Moto Display. Moto Display shows you the current time and any pending notifications whenever you pick up your phone or wave your hand over its screen (from as high as almost a foot away). It shows the info in a series of small circles in the center of the display; you can touch any circle to view more details and then optionally open or dismiss the notification. Moto Display was clearly made with AMOLED screens in mind, as those screens are able to light up individual pixels without illuminating the entire display -- which makes perfect sense for a system that shows small amounts of info while keeping most of the screen dark. LCD screens, in contrast, rely on backlights and consequently require the entire display to light up in order for any pixels to be shown. That's a lot of technical mumbo-jumbo, I realize. But when you see Moto Display in action on the Moto X Pure Edition, the effect is very apparent. Thanks to the use of LCD, the time and notification info on the screen is noticeably dimmer and more difficult to read than on previous versions of the phone -- and while the bulk of the display stays black, you can plainly see that the whole thing lights up every time the feature activates (which is especially noticeable when you're using the phone in a dim environment). 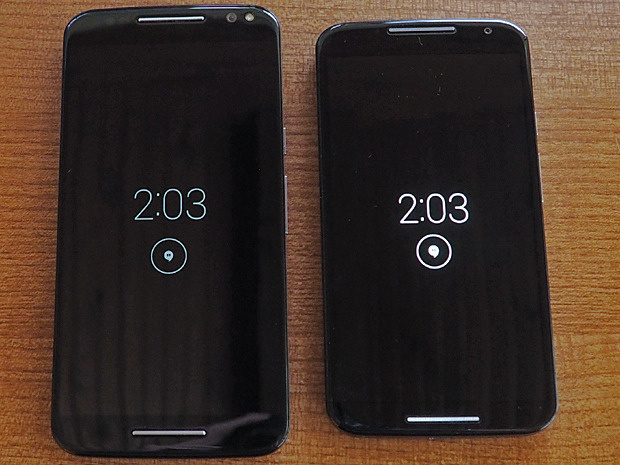 The Moto Display feature on the new Moto X (left) feels like a step down compared to the 2014 model (right). The Moto Display info also doesn't consistently and regularly "pulse" on and off when a notification is pending on the new Moto X, as it did on past models (thus effectively turning the inactive screen into an enhanced notification light of sorts). Sometimes, a new notification will flash for a few minutes and then stop; other times, it'll flash just once and then appear again only when you manually activate the feature. And when you do manually activate Moto Display to see info on the Pure Edition's screen, that info remains present for about half as long as it does on the 2014 model -- giving you a brief two-second window to see and start to interact with it. The implementation isn't unbearable, by any means, but it also isn't ideal. It feels more like a weird workaround than a setup that actually fits the feature, and it may be a bit of a letdown for anyone who's accustomed to the superior implementation the previous Moto X phones have provided.